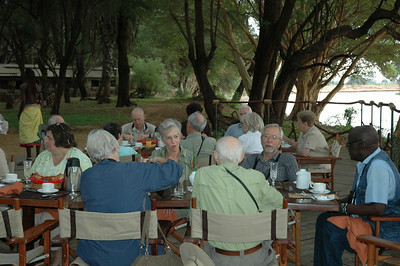 We get off the plane in Nairobi and are quickly transported to our hotel, Nairobi Safari Park lodge. After a comfortable nights rest, we start to enjoy the local birds in the gorgeous hotel gardens. On all Mass Audubon tours, hotels are selected because they are locally owned, well located with good birding nearby and, of course, very comfortable and clean. 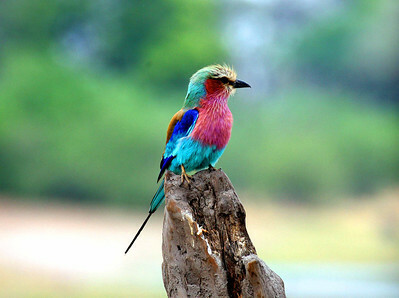 The lilac-breasted roller is very common in this part of Africa, but nevertheless, quickly becomes a favorite "oh wow" sighting. 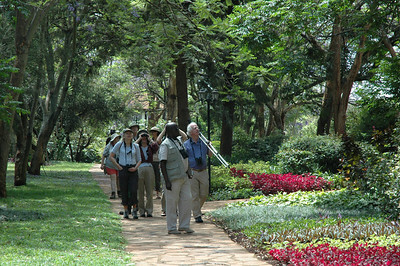 After leaving Nairobi, we headed north to the forested slopes of Mt. Kenya where we stay 2 nights in the Mountain Lodge. Mt. 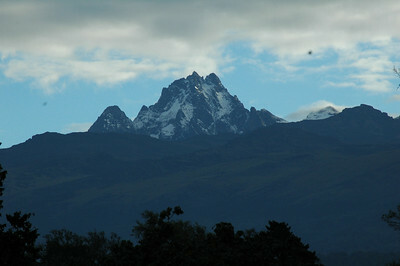 Kenya is the second highest peak in all of Africa. Our hotel here was located next to a popular waterhole where we could observe elephant, Syke's monkey, and other mammals. 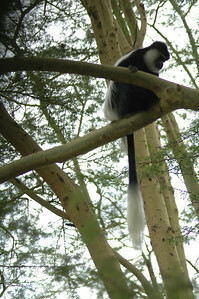 The dense, cool, moist forests on the mountain slopes are home to special species such as the black-and-white colobus monkeys who flew from tree to tree with long dramatic jumps! On an easy hike along the mountainside, we found African paradise flycatchers, Hartlaub's turaco, and several species of brilliant sunbirds. 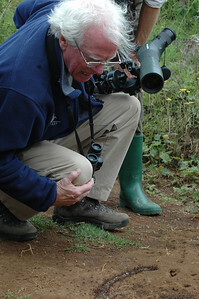 But Chris Leahy, the Mass Audubon leader, delights in all aspects of nature, including the dramatic march of army ants. 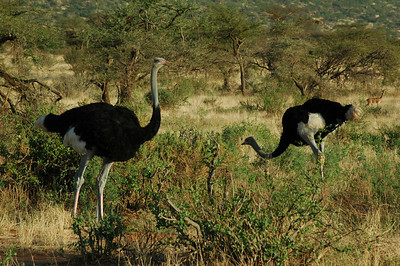 After departing from the Mountain Lodge, we drive northeast to the dry, semi desert Samburu Reserve where ostrich are easy to spot. 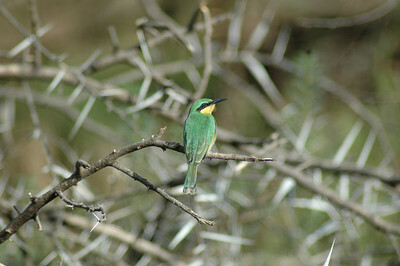 Large or small (here a tiny bee-eater), common or rare, the birding was outstanding on this trip with 412 species seen. Throughout Kenya we traveled in vans. Much to my delight, the pace of the trip allowed us plenty of time to simply watch and enjoy long, quiet views of the wildlife. 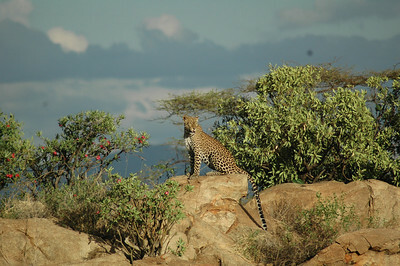 During one of the many games drives in the Samuru reserve, we watched a lone leopard sun herself for over an hour. And no other people around. 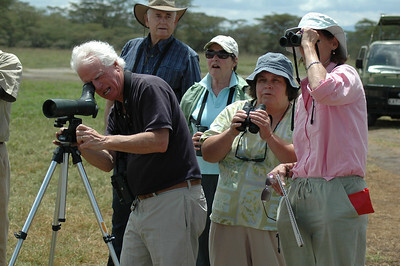 I quickly discover birding in East Africa is much easier than the tropics. 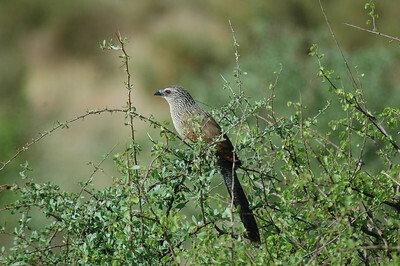 Wide open views and landscapes make this coucal (and other birds) easy to spot. 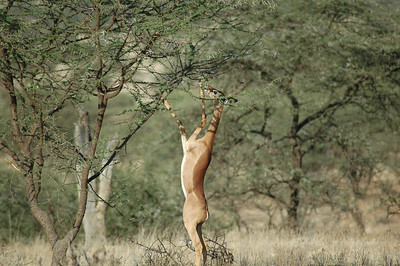 The gerenuk was only observed in Samburu. This has to be one of my favorite antelopes. Long and slender, they stretch and stand to browse on the leaves that other antelopes and giraffes miss. Great food, fine company, and a beautiful setting - what could be better? 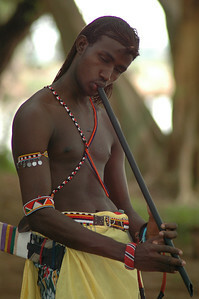 A young Samburu man at Larson's Camp in the reserve has a critical job: armed with a slingshot he must shoo the monkeys away from the dinner table! In quieter moments, his music entertains us. The accommodations were perfect. 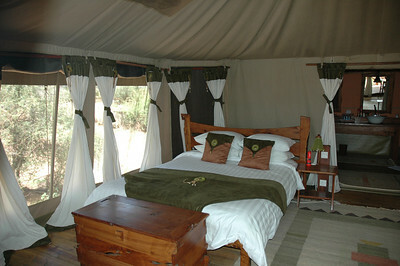 Larson's Camp in Samburu consists of high luxury tents right on the river. Kenya is home to entire families of birds that are new to me - babblers, mousebirds, bulbuls. But starlings? 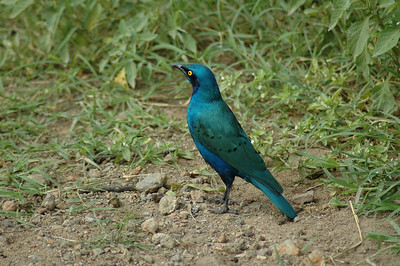 This blue-eared glossy starling is a dramatic change from our local species. 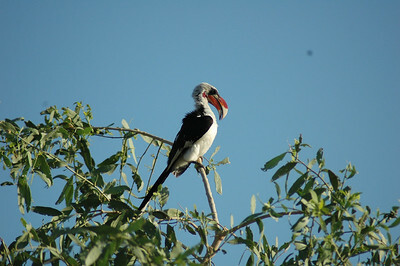 Large, colorful hornbills, like this red-billed hornbill, were also favorites of many in our group. 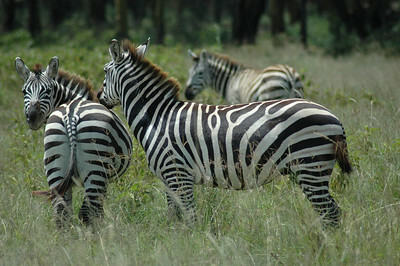 We left Samburu Reserve and headed west to the Rift Valley stopping along the way to watch these zebra. 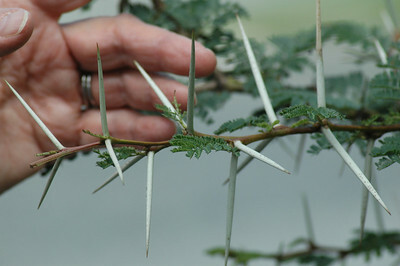 Acacia trees are an important food source for giraffe and many other creatures, despite its painful thorns. 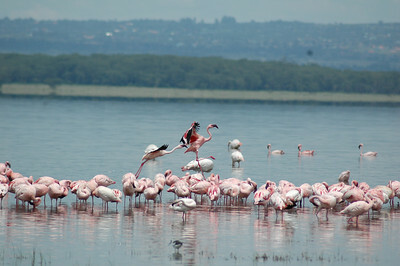 Our Kenya trip started in the mountains, then we spent time in the desert region, and now arrive at Lake Nakuru National Park, a paradise for birders. In addition to the thousands of flamingos, we also found African fish eagle, spoonbills, great white pelicans, blacksmith plover, and many other waterbirds. It is a distinct advantage to travel with other birders. In addition to their good humor and company, I also see so many more birds when there are many eyes helping to spot and locate each species. 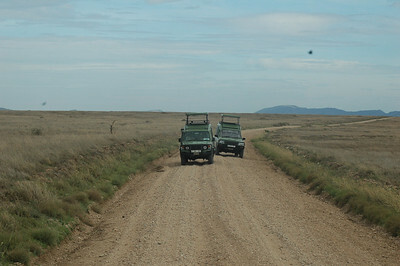 Leaving Nakuru, we have a long drive into the Maasai Mara Game Reserve. 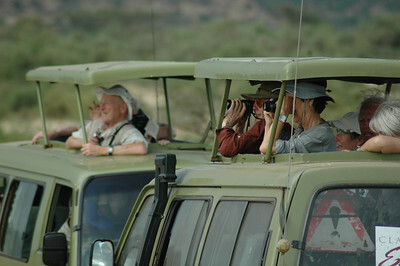 Here we scan the far distance for raptors and hornbills, as well as warthogs, rhinos, elephants, and more.